The new F Series generation is here to help you take on the wide variety of challenges you face every day, more easily and with more pleasure. F Series – Easier Than Ever. The engine meets Tier 4 Final emission standards, performs the same amount of work, while burning significantly less fuel than the previous model, which means more efficiency, less resources, and fewer CO2 emissions. Outstandingly low sound levels, you won’t believe your machine is running. The new Eco Modes, Auto Engine Speed Control and Engine Idle Shutdown help further reduce your overall fuel consumption. The M318F has the flexibility of running on either ultra-low-sulphur diesel (ULSD) fuel with 15 ppm of sulphur or less or up to B20 biodiesel fuel blended with ULSD. Cat BIO HYDO Advanced HEES reduces the impact on the environment. The Cat C7.1 ACERT engine meets today’s Tier 4 Final emission standards, and it does so without interrupting your job process. Automatic Engine Speed Control: lowers engine speed when it is not needed. NEW Engine Idle Shutdown (when activated): turns the engine off when it’s been idling for more than a pre-set amount of time. Storage compartments are useful...when well designed. The lunch box provides sufficient room to store a hard hat. Several other areas include drink, phone, or key holders. Our seats provide all the comfort needed for a long day of work, including FULL adjustment. All seats are heated and air suspended. Automatic weight adjustment and air cooled seats are available. Ride control, SmartBoom or Joystick Steering will be precious to increase your productivity. New technologies that work transparently like the swing and auto travel lock or the automatic brake and axle lock, reduce the number of tasks you need to do. Increased cab pressure, preventing from dust entry, combined with the new design contributes to reducing sound. Add in new hydro mounts to fix the cab on the frame and you have a cab that’s as quiet as any of today’s pickup trucks. Standard LED working lights and halogen roading lights LED dome light. All glass areas have been drastically increased. Choice of 70/30 front windshield or one-piece windshield. Parallel intermittent (four speeds) wipers covering the whole windshield. 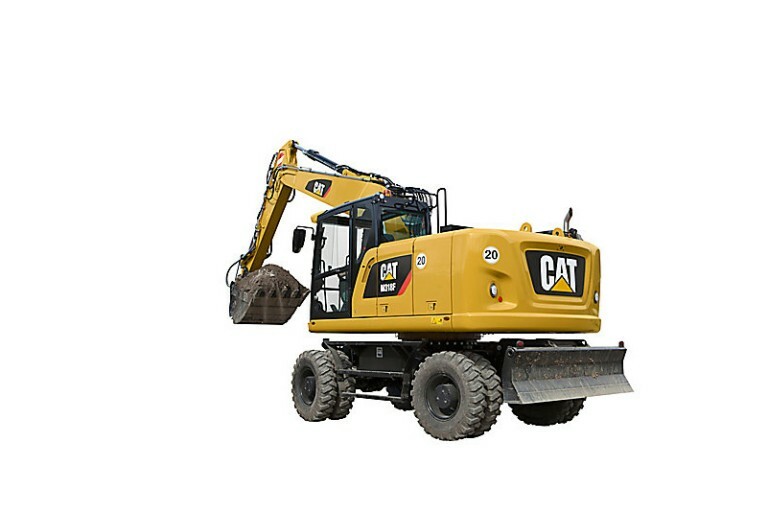 The machine automatically detects when the service brake and axle need to be locked (like when digging), or unlocked (roading), hence removing the need for the operator to systematically press the pedal. Simple Design: The new hydraulic valve compartment and routings offer a simple and clean design to help ensure durability. Everything is reachable from ground level. Minimizes the rocking effect when working free on wheels. The disc brake system acts directly on the hub instead of the drive shaft to avoid planetary gear backlash. Booms and sticks are welded, box section structures with thick, multi-plate fabrications in high stress areas for the tough work you do. Scraping rock and finishing work is easy and fast. SmartBoom simplifies the task and allows more focus on stick and bucket, while the boom freely goes up and down without using pump flow. The ride control system lets you travel faster over rough terrain with improved ride quality for the operator. Accumulators are acting as shock absorbers to dampen the front part motion.